Check this out. 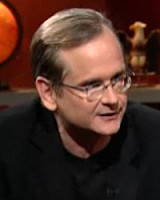 Lessig has recently switched focus away from copyright and to fighting corruption, however this did not stop the Freakonomics blog readers from asking him about copyright issues. Also, if you are interested in seeing the original Colbert interview referenced in the blog, here it is.